3.box pieces of the five week life I've gathered. to fill spaces in my future life. makes a ritual of flower-giving sent. 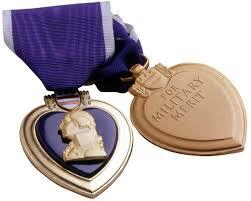 to look at the 2.purple heart. and I would toss them out with the five week litter. This morning the bud at the stalk's tip 5.unfurled. press them between 7.pages of memory. I'll discover their 8.peculiar poetry. Simmonds-McDonald, H. 'Orchids' in A World of Poetry. Edited by Mark McWatt and Hazel Simmonds McDonald. Pearson Education Ltd, 2005. The persona is moving from a house that she has occupied for five weeks. She has sent her belongings to her future home, but one item remains in her old space, an orchid. 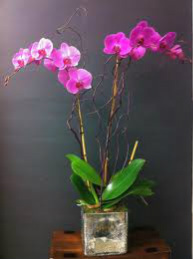 The persona clarifies (www.bulbsoup.com) that she was given the orchid as a gift, but implies that it holds no value because the gifting of orchids is habitual for the person who gave her. 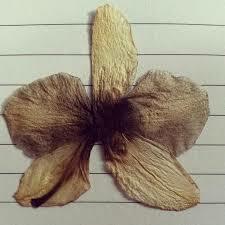 She describes the flower as odourless, but attractive. She watered the orchid once, expecting it to die, but it survived. It not only survived, but bloomed. The persona contemplates plucking the bloom and pressing it between the pages of a book. The purpose of this is to allow her to appreciate the flower. 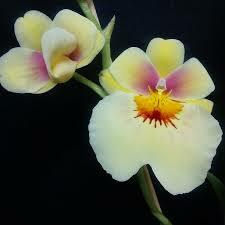 The orchid's ful l blown blossoms are being compared to a polished (www.bulbsoup.com) poem. The word polished in this comparison implies perfection, shiny and pleasant to read. The purple heart literally refers to the splash of color in the center of the orchid's bloom, but it could also refer to the bravery of the flower. This is so because a purple heart, in the army, is a medal that a soldier receives for bravery. This phrase implies that the persona's life is literally in boxes, all her belongings are stored and ready to be moved. This phrase implies that the persona places no value in the orchid because its giver gifted it without any sentiment attached. This word literally means to open. Therefore, despite the persona's attempts at killing the orchid, through starvation, it not only survived but flourished. These full-blown blooms represent the flower at its peak, where it is most full of life, as well as where it is most usually appreciated. This refers to the practice of (www.bulbsoup.com) placing a flower between the pages of a book, thereby drying, or killing the flower. The purpose of this act is to keep the flower for nostalgic reasons. This phrase highlights the persona's desire to discover the value in the flower. It is very IRONIC, however, that she would choose to kill it in order to achieve this goal. Usually people place value in a living flower that can give pleasure through its beauty. The tone of the poem is calm and contemplative. Death, nature, survival, desire/ dreams.